Click here to view an animated version of this procedure. A coronary artery bypass graft (CABG) is an open-heart surgery to restore blood flow to the heart muscle. A part of a blood vessel from another part of the body is attached to a blocked artery of the heart. The attached blood vessel creates a new path for blood to flow around the blockage. Atherosclerosis is a common disease of the arteries. Over time cholesterol and fats collect on the walls of blood vessels and form a plaque. As the plaque grows, it decrease the amount of space that blood has to pass through and slows blood flow to the heart muscle. 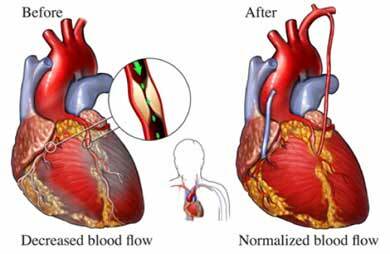 This low blood flow can lead to chest pain called, angina . Eventually, plaque can cause the blood vessel to tear and form a blood clot which can completely block blood flow and lead to a heart attack or death. Talk to your doctor about your medication. You may need to stop taking certain medication for one week before surgery. Eat a light meal the night before. Do not eat or drink anything after midnight. Arrange for help at home after the procedure. General anesthesia will be given. You will be asleep during the procedure. An incision will be made through the skin. The breastbone will be split to open the chest. For traditional CABG, a heart-lung machine will be connected to major blood vessels of the heart. The machine will act as the heart and lungs during the surgery so that blood and oxygen will continue to flow through the body while the heart is repaired. An artery will be taken from the chest wall or a section of a vein will be removed from the leg. The new vessel section will be connected by the blocked arteries. One end of the new vessel will be attached just above the blockage. The other end will be attached just below the blockage. When the new vessel is in place, the heart will be allowed to wake up. Electrical shocks may be needed in some cases to make sure the heart is beating with the right rhythm. Once the doctor is sure that blood is flowing well, the heart-lung machine will be disconnected. Temporary tubes may be placed in your chest to help drain any fluid. The breastbone will be wired together. The chest will be closed with stitches or staples. There is a less invasive approach, called minimally invasive coronary artery surgery. The purpose of this surgery is the same, but the technique and condition of the patient are different. Patients who have only one or two clogged arteries may be candidates for this approach. In this technique, a small incision is made in the chest. The doctor usually uses an artery from inside the chest for the bypass. The key difference in this technique is that the doctor performs the surgery while the heart is beating. With this technique, the heart-lung machine is not needed. If you need CABG, your doctor will carefully evaluate you to determine the best technique for you. Anesthesia prevents pain during surgery. There will be pain for a few weeks after the surgery because of the chest opening. You will be given medication and support tips to help manage pain during recovery. Frequent deep breathing and coughing exercise to prevent fluid build up in the lungs. Walking as soon as possible after surgery to prevent blood clots in legs. Bypass surgery does not cure heart disease. The grafted blood vessels or other heart vessels can become clogged later on. You will be encouraged to make healthy lifestyle changes to prevent future complications. Coronary artery bypass graft (CABG) surgery. EBSCO DynaMed Plus website. Available at: http://www.dynamed.com/topics/dmp~AN~T113960/Coronary-artery-bypass-graft-CABG-surgery . Updated November 29, 2017. Accessed November 30, 2017. Coronary artery bypass graft surgery. Cardio Smart website. Available at: https://www.cardiosmart.org/Healthwise/hw10/1095/hw101095. Accessed November 30, 2017. Explore coronary artery bypass grafting. National Heart, Lung, and Blood Institute website. Available at: https://www.nhlbi.nih.gov/health/health-topics/topics/cabg. Updated February 23, 2012. Accessed November 30, 2017. 12/3/2010 DynaMed Plus Systematic Literature Surveillance http://www.dynamed.com/topics/dmp~AN~T113960/Coronary-artery-bypass-graft-CABG-surgery : Morone NE, Weiner DK, Belnap BH, et al. The impact of pain and depression on recovery after coronary artery bypass grafting. Psychosom Med. 2010;72(7):620-625.